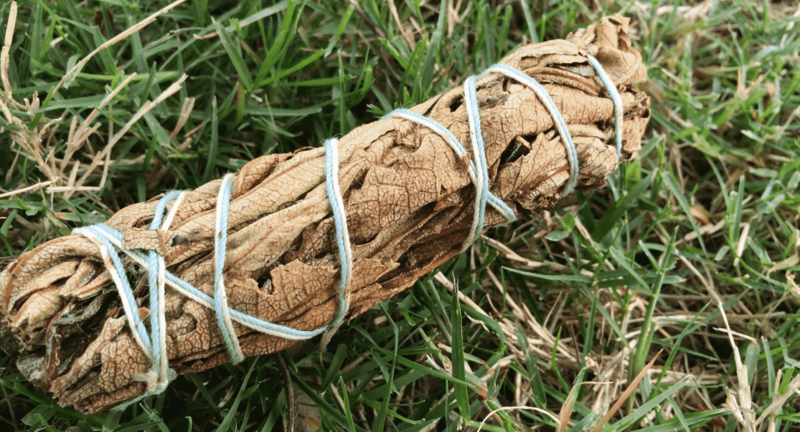 Smudging or ritually burning sage is a Native American tradition for healing, clearing a space and as a religious ceremony. The original meaning of the ritual was that the rising smoke carried the request to Spirit. In modern times Sage is often used to remove household odors and is said to alleviate airborne germs. Native Americans burned sage to clear both the mind as well as the home. Sage has long been considered a ‘cure-all.’ In the 17th Century, John Evelyn wrote “a plant indeed with so many wonderful properties. It is said to render men immortal.” Sage was used in baths to soothe aching muscles and tired feet. In the Middle Ages, Sage was a conventional medicine and was used to cure everything from coughing to venereal disease. In China, Sage tea is a favorite beverage for quieting the nerves and keeping one well. Smudging is the act of clearing and releasing negative energy. So Smudging is best done when the Moon is waning. The Waning Moon is the time between the Full Moon and the New Moon. As something declines, it becomes less, just as the Moon becomes smaller and smaller. Smudging can be done in the day or evening. Smudging requires a bit of concentration and observation of how the smoke is moving through the air. It’s best done when you will not be disturbed by phone or family members. It is an excellent idea to Smudge before you settle into a new home. You will probably want to smudge when negative people have been in your home and have left some of their energy behind. Smudging can also be done in the Spring as part of the re-opening of the home to the world. After the Spring cleaning when the windows again are open to the warm breezes, a good house Smudging can clear the energy for new opportunities. Store sage in a cool, dry place. Sage should be dried if it is to be kept in a closed container. Store loose Sage in a glass jar with a cork top. Smudge sticks can be placed in a drawer or cabinet. To Smudge a room involves walking around the room with the smoldering Sage, so at times it is easier to use a Smudge stick rather than the loos Sage. Always smudge with care. If a breeze from a fan or open window catches loose burning Sage leaves, they may be spread around the room, perhaps causing something else to catch fire. When you smudge a room, the smudge stick may drop some burning ash, so you may want to capture the ash using a small plate underneath. Apply flame to the Sage stick until the smoke rises clearly, then wait until the fire dies down, so it smolders, do not shake out the flame but let it subside naturally. Carry the stick in your power hand (the hand you write with) and move to the main door in the room (or, if there is more than one door, choose the one closest to you). Trace around the door in a clockwise motion following the outline of the molding around the door. Then proceed around the room toward your right (clockwise), stopping at each window to trace around it, and each door to do the same. As you approach pieces of furniture, move the stick above them and below them keeping the plate or dish underneath the Smudge stick to catch any ash that might fall on your furniture and or floor. As you move around the room, you may state aloud that you wish the room cleared of negativity, that you want peace and joy to enter, and that evil must leave. You can call on your guides or the universe, in general, to help you accomplish your wish. As you Smudge, notice how the smoke moves. Pause every few feet and watch the smoke rise. If it rises straight up, the area is clear. However, if the smoke seems to turn or move oddly, there may rest some negative energy, a mischievous spirit, or a connection to someone who wishes you ill. Note where in the room this negative energy is and what object it may be connected to. Sometimes we have items in our homes that for some reason have collected some negative energy. They may have been bought used and still have the energy of the previous owner, or maybe they were gifts from people who were not on the best terms with you. To clear this particular space, hold the Smudge stick in place until the smoke rises straight up. If it is around an object, pass the object through the smoke several times, and then hold the smoldering sage stick above the object and see if the smoke will rise straight up. Continue around the room until you reach the place you started and cross that place to complete the circle. Then extinguish your Smudge stick. Smudge sticks can be saved for future use. Grinding Smudge stick out is the preferred method for extinguishing it, but sometimes it is difficult to put out a smudge stick. Indications that your smudge stick may still be burning are that you can still see a smoldering flame inside, or that smoke is still rising from the Smudge stick. An alternative way to extinguish your stick is to put the burning end of the smudge stick into a cup of sand or salt. As a last resort, you can douse the burning end in water although this is considered inappropriate. It is best to extinguish your smudge stick using a compatible element like earth. Smudging a house is simply an extension of Smudging a room. As you proceed from room to room, the Smudge stick may not give off as much readable smoke as you move through the house. It is considered acceptable to relight the Smudge stick as you go. Smudge sticks can be lit using a match, lighter, or candle. When Smudging an entire house, you can begin the ceremony at your altar. If you don’t have an altar, begin in the Kitchen (the power center of the house). Move through each room as described above and then move to the next room as you would naturally, following the wall to the door and then through the door and so on. When you come to closets, it is perfectly alright just briefly to wave the stick inside the closet, or you might end up with clothes that smell very much like Sage. Bathrooms should be done correctly precisely as they are both wealth and health centers of the house. Garages are optional; if you have an attached garage, you can Smudge it as you go through the house. Move through the house until you return to the room where you started. It is important that you end where you started even though it may mean moving through some rooms twice. Extinguish the stick in the room where you began. Objects can be Smudged to clear the energy that may have been picked up either by someone touching that object or by where the object has been. If you buy a crystal in a store, the crystal most likely has the energy of that store. Smudging brings the energy to a neutral state at which time you can put your energy into it. To Smudge an object, pass the object through the smoke several times. Most objects are quickly cleared. When you touch the object, it will feel like yours, and it will feel light and familiar. However, objects received from negative people, or ones you have which rewind of old, adversarial relationships may not clear easily, and when you touch the object, your thoughts will still turn to that person or situation. In severe cases, negative energy enters the house and your life through a mental doorway created by that object. In this case, it is better to remove the item from your home. A person may wish to be Smudged when they come into close contact with someone or something they believe is negative. A person who has witnessed a crime or an act of violence may want to be Smudged. In this vast world, we live in, and we can sometimes come into contact with people that we don’t feel good about. It can be they are on a very different path than ourselves. People have a right be on whatever path they choose, and you have the right to not agree with that path and to cleanse your auric field (the energy field that surrounds you) after contact with them. To Smudge a person, light the stick and, holding it about 6 inches away from the body, start at the back of their head and wave the stick back and forth as you move slowly down the back of their body. Do not hold the stick over their head. As you move the stick down, they may feel a tingly sensation or a quick shiver. This cleanses the auric field. Move to the front and start smudging about six inches out from the top of the forehead, and move down the body again. Hold each arm out horizontally and move the stick under each arm and out to the fingertips. Then hold the smudge stick behind them once again about midway up their back and still 6 inches away from them. If the smoke rises, they are clear. If it does not, repeat the process a second time. You would smudge yourself for any of the same reasons that you would smudge another person. Light the stick and, keeping it well away from your body, move the stick in small circles in front of you. Begin at your head and move down the front of your body. Extend each arm and move the stick under the arm slowly, letting the smoke rise and touch your arm. To do your back, move the stick, so smoke is rising in front of you and then step through the smoke. Now, by intention, you are clearing the energy behind you. Step through the smoke several times to completely clear your back.